sauce | I Am Not A Restaurant! Speaking of friends, I met Andrew Carmellini when he visited my radio show. Nicest guy and a very talented chef. I enjoy his restaurants in New York, Locanda Verde and Lafayette among them. But if you can't get to NYC, he shares the same spirit in “Urban Italian”. Here I share his lamb ragu. (Click here for the recipe). It's NOT an all day cooking affair, but you do need to set aside a couple of hours to be at home. Serve day of, or make ahead! My advice – add this weapon to your arsenal of kitchen favorites. The handful of ingredients are readily available from pantry and fridge – a savior for last minute family dinners or entertaining. Btw – I didn't have enough canned tomatoes, adding chunks of late summer faves doesn't hurt a bit. I am a sucker for pasta shapes. There, I've said it. This weekend my guy and I played tourist, strolling through New York's Eataly among other places. Actually, the day couldn't have gone better. Street parking during the winter in New York is a gift and plays to my frugal nature. Jam was the original target, but when in Rome…! Plus having spent little to leave the car, we could indulge in other groceries. 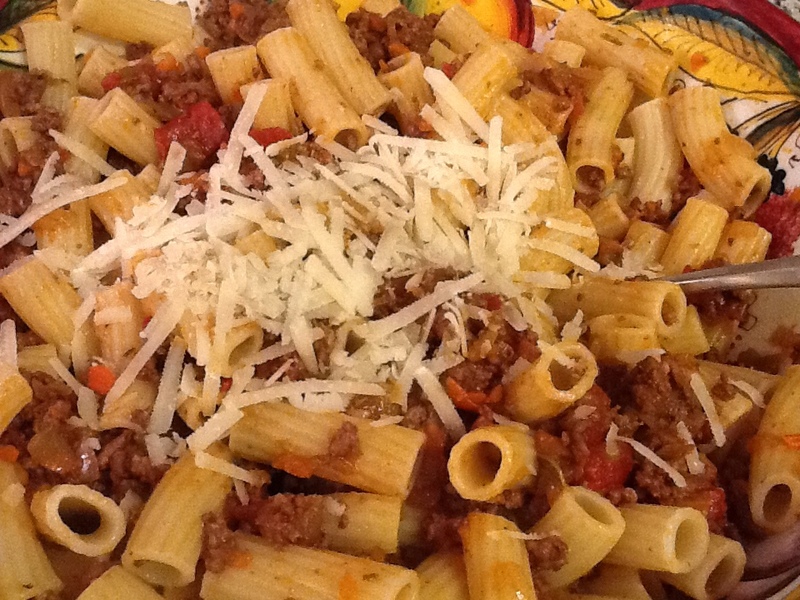 And there it was…radiatore, pasta that looks like mini radiators, ready to cling to extra sauce. 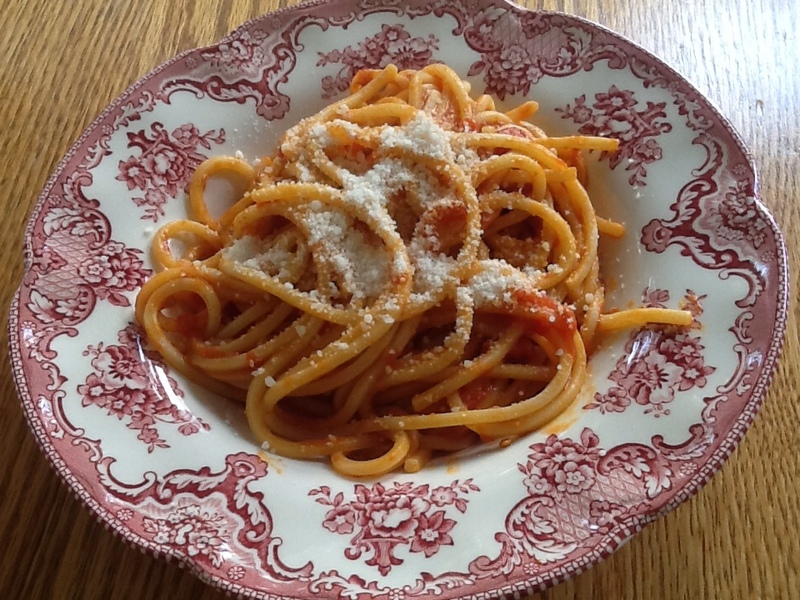 I didn't have enough leftover marinara (see earlier blog about making sauce) so I extended. It's got no name but boy was it delizioso! Cook pasta according to directions in heavily salted water. Meanwhile heat olive oil in large skillet. Fry zucchini seasoned with salt. When it's browned, add the sauce. Drain pasta, saving 1/2 cup of the water. Toss pasta into skillet, adding pasta water as necessary for sauce. 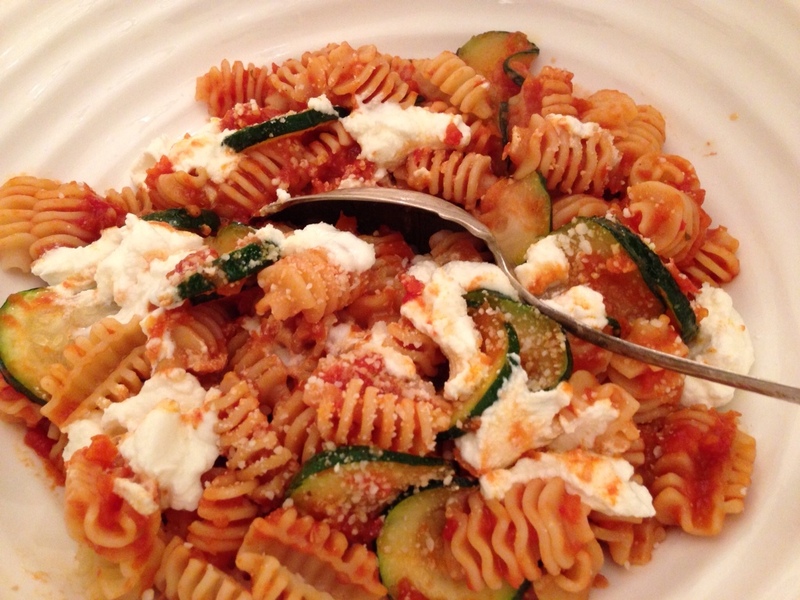 Put it into a bowl, combine with ricotta and sprinkle with Parmesan. This recipe made a generous 3, or first course for 4. You can always add a little more of everything, and about 10 oz. of pasta to make it a real family of 4 dish. Or double down, it's super flex!